The Amazing Spider-Man (vol. 1) #282 (Nov. 1986): "The Fury of X-Factor!" The Champions (vol. 1) #1 (Oct. 1975): "The World Still Needs...the Champions!" The Champions (vol. 1) #2 (Jan. 1976): "Whom the Gods Would Join..."
The Champions (vol. 1) #3 (Feb. 1976): "Assault on Olympus"
The Champions (vol. 1) #4 (Mar. 1976): "Murder at Malibu!" The Champions (vol. 1) #5 (Apr. 1976): "The Economy is so Bad that..."
The Champions (vol. 1) #6 (June 1976): "Mad Dogs and Businessmen"
The Champions (vol. 1) #7 (Aug. 1976): "The Man Who Created the Black Widow"
The Champions (vol. 1) #8 (Oct. 1976): "Divide and Conquer!" The Champions (vol. 1) #9 (Dec. 1976): "The Battle of Los Angeles!" The Champions (vol. 1) #10 (Jan. 1977): "One Man's Son is Another Man's Poison!" Dark Angel #9 (Apr. 1993): "Assassination, Part One"
The Defenders (vol. 1) #131 (May 1984): "If This Be Walrus...!" The Defenders (vol. 1) #132 (June 1984): "The Phantom of Gamma-Ray Flats"
The Defenders (vol. 1) #133 (July 1984): "The Pajusnaya Consignment"
The Defenders (vol. 1) #134 (Aug. 1984): "Manslaughter"
The Defenders (vol. 1) #135 (Sep. 1984): "The Fire at Heaven's Gate"
The Defenders (vol. 1) #136 (Oct. 1984): "Bodies and Souls"
The Defenders (vol. 1) #137 (Nov. 1984): "Hearts and Minds"
The Defenders (vol. 1) #138 (Dec. 1984): "Three Women"
The Defenders (vol. 1) #139 (Jan. 1985): "Hungry Like the Wolf!" The Defenders (vol. 1) #140 (Feb. 1985): "The Heartbreak Kid!" The Defenders (vol. 1) #141 (Mar. 1985): "All Flesh is Grass!" The Defenders (vol. 1) #142 (Apr. 1985): "M.O.N.S.T.E.R.!" The Defenders (vol. 1) #143 (May 1985): "Another Runner..."
The Defenders (vol. 1) #144 (June 1985): "Dragon Midnight"
The Defenders (vol. 1) #145 (July 1985): "Five Women"
The Defenders (vol. 1) #146 (Aug. 1985): "Fun!" The Defenders (vol. 1) #147 (Sep. 1985): "...and Games"
The Defenders (vol. 1) #149 (Nov. 1985): "Lonely as a Cloud"
The Defenders (vol. 1) #150 (Dec. 1985): "The Stars in Their Courses"
The Defenders (vol. 1) #151 (Jan. 1986): "Second Degree Manslaughter"
The Defenders (vol. 1) #152 (Feb. 1986): "The End of All Songs"
Iceman (vol. 1) #1 (Dec. 1984): "The Fuse!" 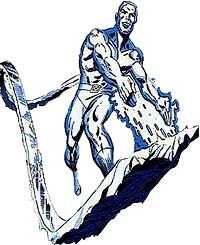 Iceman (vol. 1) #2 (Feb. 1985): "Instant Karma!" Iceman (vol. 1) #3 (Apr. 1985): "Quicksand!" Iceman (vol. 1) #4 (June 1985): "The Price You Pay!" Iceman (vol. 2) #1 (Dec. 2001): "The Iceman Cometh"
Iceman (vol. 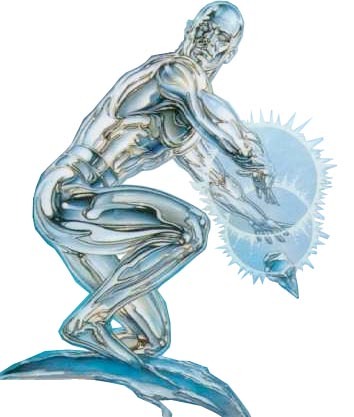 2) #2 (Jan. 2002): "Cold Snap"
Iceman (vol. 2) #3 (Feb. 2002): "Icebreaker"
Iceman (vol. 2) #4 (Mar. 2002): "No More Mr. Ice Guy"
Marvel Comics Presents (vol. 1) #59 (Sep. 1990): "On the Road with Wolverine and the Hulk, Part 6: Old Friends"
Marvel Fanfare (vol. 1) #20 (May 1985): "Pottspourri"
The Secret Defenders #18 (Aug. 1994): "A Tiny Little War"
The Secret Defenders #19 (Sep. 1994): "Survival of the Fittest"
Untold Tales of Spider-Man #21 (May 1997): "Menace!" X-Factor (vol. 1) #1 (Feb. 1986): "Third Genesis"
X-Factor (vol. 1) #2 (Mar. 1986): "Bless the Beasts and Children"
X-Factor (vol. 1) #3 (Apr. 1986): "Regression Obsession"
X-Factor (vol. 1) #4 (May 1986): "Trials and Errors"
X-Factor (vol. 1) #6 (July 1986): "Apocalypse Now!" X-Factor (vol. 1) #7 (Aug. 1986): "Fallout!" X-Factor (vol. 1) #8 (Sep. 1986): "Lost and Found!" X-Factor (vol. 1) #9 (Oct. 1986): "Spots!" X-Factor (vol. 1) #10 (Nov. 1986): "Falling Angel!" X-Factor (vol. 1) #11 (Dec. 1986): "Redemption!" X-Factor (vol. 1) #12 (Jan. 1987): "Boom Boom Boom!" X-Factor (vol. 1) #13 (Feb. 1987): "Ghosts!" X-Factor (vol. 1) #14 (Mar. 1987): "The Mutant Program!" X-Factor (vol. 1) #15 (Apr. 1987): "Whose Death Is It Anyway?" X-Factor (vol. 1) #17 (June 1987): "Die, Mutants, Die!" X-Factor (vol. 1) #18 (July 1987): "The Enemy Within"
X-Factor (vol. 1) #19 (Aug. 1987): "All Together Now!" X-Factor (vol. 1) #20 (Sep. 1987): "Children's Crusade"
X-Factor (vol. 1) #21 (Oct. 1987): "For Every Action..."
X-Factor (vol. 1) #22 (Nov. 1987): "If I Should Die..."
X-Factor (vol. 1) #23 (Dec. 1987): "You Say You Want Some Evolution?" X-Factor (vol. 1) #24 (Jan. 1988): "Masks"
X-Factor (vol. 1) #25 (Feb. 1988): "Judgement Day!" X-Factor (vol. 1) #26 (Mar. 1988): "Casualties"
X-Factor (vol. 1) #27 (Apr. 1988): "Gifts!" X-Factor (vol. 1) #28 (May 1988): "Countdown!" X-Factor (vol. 1) #29 (June 1988): "Fame!" X-Factor (vol. 1) #30 (July 1988): "Kiss of Death!" X-Factor (vol. 1) #31 (Aug. 1988): "Kiss Off!" X-Factor (vol. 1) #33 (Oct. 1988): "For All the World to See"
X-Factor (vol. 1) #35 (Dec. 1988): "Go to the Orphan Maker!" X-Factor (vol. 1) #36 (Jan. 1989): "Transformations!" X-Factor (vol. 1) #37 (Feb. 1989): "A Matter of Honor"
X-Factor (vol. 1) #40 (May 1989): "Dust to Dust"
X-Factor (vol. 1) #41 (June 1989): "Golden Boy!" X-Factor (vol. 1) #42 (July 1989): "All That Glitters..."
X-Factor (vol. 1) #43 (Aug. 1989): "Judgment War, Part 1: Kidnapped"
X-Factor (vol. 1) #44 (Sep. 1989): "Judgment War, Part 2: Another World!" X-Factor (vol. 1) #45 (Oct. 1989): "Judgment War, Part 3: Arena!" X-Factor (vol. 1) #46 (Nov. 1989): "Judgment War, Part 4: Exchange"
X-Factor (vol. 1) #48 (Dec. 1989): "Judgment War, Part 5: Common Ground!" X-Factor (vol. 1) #49 (Mid-Dec. 1989): "Judgment War, Part 6: Power Struggle"
X-Factor (vol. 1) #50 (Jan. 1990): "Judgment War, Part 7, Finale: Judgement Day"
X-Factor (vol. 1) #51 (Feb. 1990): "Home!" X-Factor (vol. 1) #52 (Mar. 1990): "Celebrity!" X-Factor (vol. 1) #53 (Apr. 1990): "Ghosts"
X-Factor (vol. 1) #54 (May 1990): "Crimson"
X-Factor (vol. 1) #55 (June 1990): "Desperately Seeking Vera"
X-Factor (vol. 1) #56 (July 1990): "Ravens"
X-Factor (vol. 1) #57 (Aug. 1990): "Reflections"
X-Factor (vol. 1) #58 (Sep. 1990): "Nevermore"
X-Factor (vol. 1) #59 (Oct. 1990): "Yesterday's News"
X-Factor (vol. 1) #63 (Feb. 1991): "Family"
X-Factor (vol. 1) #64 (Mar. 1991): "The Price"
X-Factor (vol. 1) #65 (Apr. 1991): "Endgame Part 1: Malign Influences"
X-Factor (vol. 1) #67 (June 1991): "Endgame Part 3: Lunar Opposition"
X-Factor Annual #1 (Oct. 1986): "Grand Design"
X-Factor Annual #4 (1989): "Happy Summer Vacation"
X-Factor Special: Prisoner of Love (1990): "Prisoner of Love"
X-Force / Champions Annual '98 (Dec. 1998): "Demon from Within"
X-Men (vol. 1) #64 (Jan. 1970): "The Coming of Sunfire!" X-Men (vol. 1) #74 (Feb. 1972): "A Marvel Masterwork Pin-Up"
X-Men (vol. 2) #66 (Aug. 1997): "Start Spreadin' the News..."
X-Men (vol. 2) #67 (Sep. 1997): "The End of Days"
X-Men (vol. 2) #68 (Oct. 1997): "Heart of the Matter"
X-Men (vol. 2) #69 (Nov. 1997): "Last Exit"
X-Men (vol. 2) #188 (Sep. 2006): "Supernovas: Part 1"
X-Men (vol. 2) #189 (Sep. 2006): "Supernovas: Part 2"
X-Men (vol. 2) #190 (Oct. 2006): "Supernovas: Part 3"
X-Men (vol. 2) #192 (Dec. 2006): "Supernovas: Part 5"
X-Men (vol. 2) #193 (Jan. 2007): "Supernovas: Part 6"
X-Men (vol. 2) #194 (Feb. 2007): "Primary Infection: Part 1"
X-Men (vol. 2) #195 (Mar. 2007): "Primary Infection: Part 2"
X-Men (vol. 2) #197 (May 2007): "Red Data: Part 1"
X-Men (vol. 2) #198 (June 2007): "Red Data: Part 2"
X-Men (vol. 2) #199 (July 2007): "Red Data: Part 3"
X-Men: Black Sun #2 (Nov. 2000): "Second Spell: Spear the Angel!" X-Men: Black Sun #3 (Nov. 2000): "Third Spell: Bare the Claws!" X-Men: First Class Special #1 (July 2007): "The Soul of a Poet"
X-Men: First Class Special #1 (July 2007): "A Girl and Her Dragon"
X-Men: First Class Special #1 (July 2007): "The Mental Might of Marvel Girl"
X-Men: Legacy (vol. 1) #219 (Feb. 2009): "Jagannatha"
X-Men: Legends (June 2000): "Diary of a False Man"